We even make them for men, for inside the kayak to sit down on. Grass has many traditional uses, and was woven into baskets, bags, mats and even sails for umiaks. This long narrow mat was laid inside a kayak to make a comfortable seat. Anna Etageak: They twist the thread for this one. Twist it and fill it. Aron Crowell: I see what you mean. Instead of being flat, as you go along, you twist it. Oscar Koutchak: William aanaaga taimanasiliuguuruq. Anna Etageak: Yes, and aa Tuaquan [Mrs. Katchataq]. And they make a little rug for the floor. Theresa Nanouk: Yes, a rug by the door like this mat. Doormat. When they’re new, they’re tough, the grass. Tukmiilitaq [mat, doormat]. Or aluiyaq [clean your soles by the door before you enter] maybe. Oscar Koutchak: Or maybe the ladies when they’re sewing could sit on this on the floor. Theresa Nanouk: Oh yes, that’s right. Oscar Koutchak: In the kayak opening. Anna Etageak: We even make them for men, for inside the kayak to sit down on. 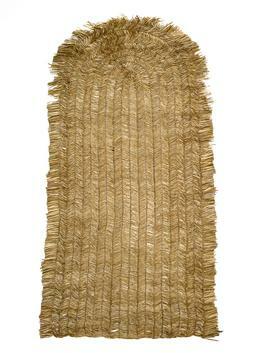 Oscar Koutchak: A multi-purpose rug. 1. According to Frances Charles, caribou hides were also used as kayak mats. Grass mats were also used outside the home. While fishing for tomcod in the Norton Sound, people used them for sitting on the ice and making small wind shelters. (7) Grass mats served as seating pads in kayaks and as sails for kayaks and umiaks (from umiaq “open skin boat”).